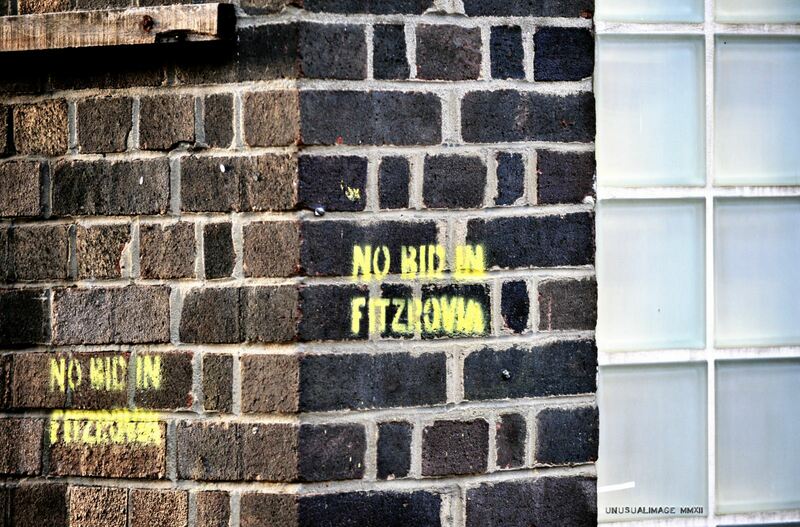 Fitzrovia graffiti creates controversy and disagreement between residents and local authorities. The rapidly developing graffiti art form in Fitzrovia continues to create controversy and disagreement amongst residents and law enforcers. This essentially stems from the fact that there are many different styles of graffiti whose values are highly contested. Some styles are reviled by many and some are held in high esteem by others and/or by the same people. In modern times, paints, especially spray paints and marker pens have become the most commonly used (and by no means only) graffiti materials to convey a variety of personal, gang, territorial, social and political messages. Whilst some street art is atrocious amounting to little more than wanton vandalism, we may be wise to stand back and appreciate the plurality and diversity of the art form that surrounds us in Fitzrovia. Collectively, these creations of imagination have the potential to expand our sense of possibility and may also in some cases have the potential to reaffirm life. Graffiti as political activism reminds us that in our rather complacent and smug social-democratic societies there is a real danger that we can become deeply conformist and even suffocate. This type of graffiti takes us beyond narrow political debates and reminds us that humans tend to find meaning in extreme situations and that it may be far better to actively engage than to become complacent and complicit. We are encouraged to go beyond prim distaste for any departures from standard progressive processes and allow ourselves to think anew and use these materials as the impetus for acquiring the building blocks for the creation of new and better ways of doing things. Graffiti in response to BID proposals. The limitation of Graffiti to bring about political change has been immortalised in the work of Banksy (If graffiti changed anything it would be illegal). Over a year ago a “well-known” public figure had stumped up the cash for a sheet of perspex to protect this Banksy stencil in Fitzrovia from City Hall’s whitewashers (City Hall has a zero tolerance policy on graffiti). The great graffiti debate continues to rage in Westminster and it is certainly bringing a lot of attention. 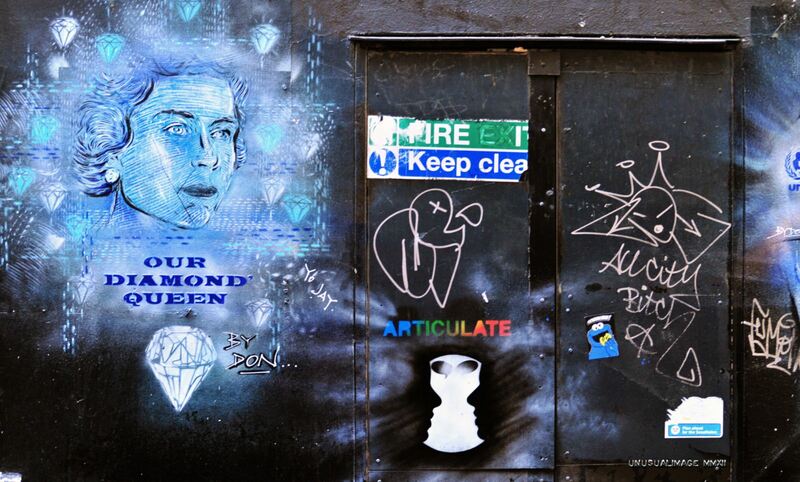 And a relatively new addition to the burgeoning art Galleries of Fitzrovia is Lazarides, run by Steve Lazarides, who is well known for helping Banksy to become a global phenomenon. This brand-new five-floor spread opened last May in a Georgian town house that was once a brothel. The Outsiders is also part of Lazarides Ltd, and many of their artists have succeeded outside of the traditional gallery system, emerging through popular fields like graffiti, design, and illustration. The Fitzrovia Mural, painted in 1980. 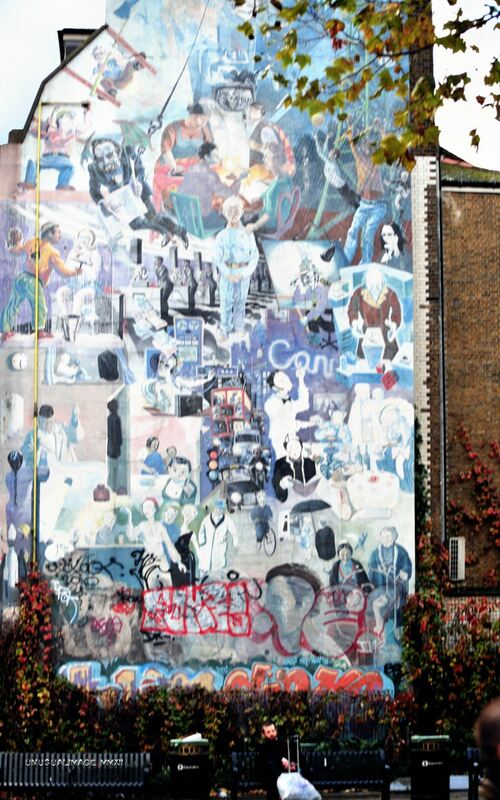 The Fitzrovia Mural was created in 1980 featuring a montage of scenes relevant to the area at that time. There have been several more recent additions to the lower elevation, of dubious relevance, causing some consternation and disapproval form the more traditional residents. 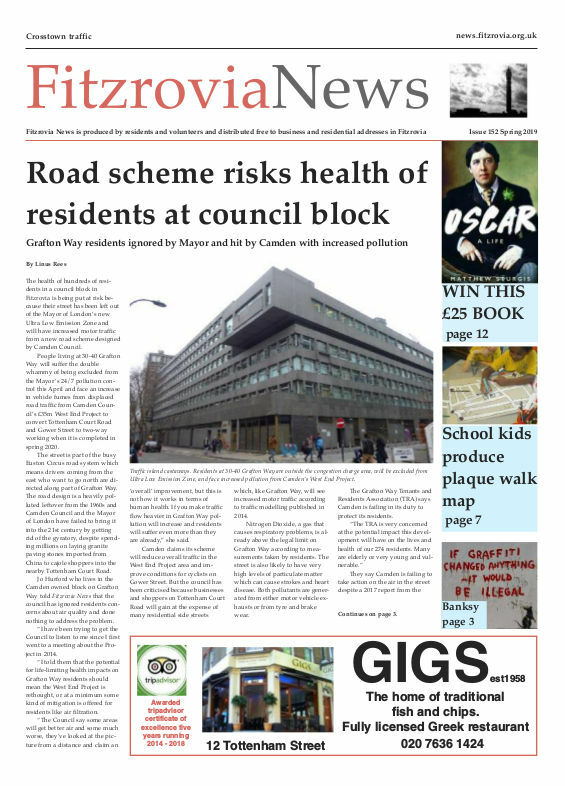 Similar concerns have been expressed about what is seen as the defacing of the Fitzrovia Neighbourhood Centre’s mural. Paul Don Smith. 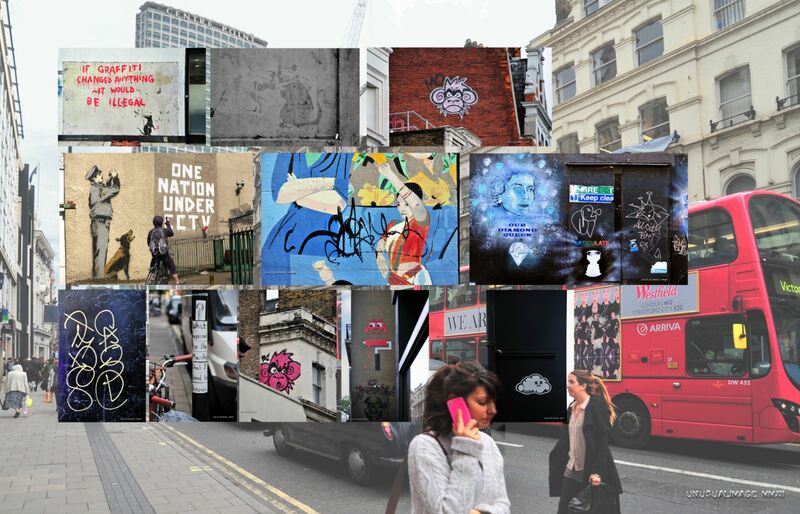 Don’s work appears everywhere capturing and capitalising on current topics. Corrosive art. 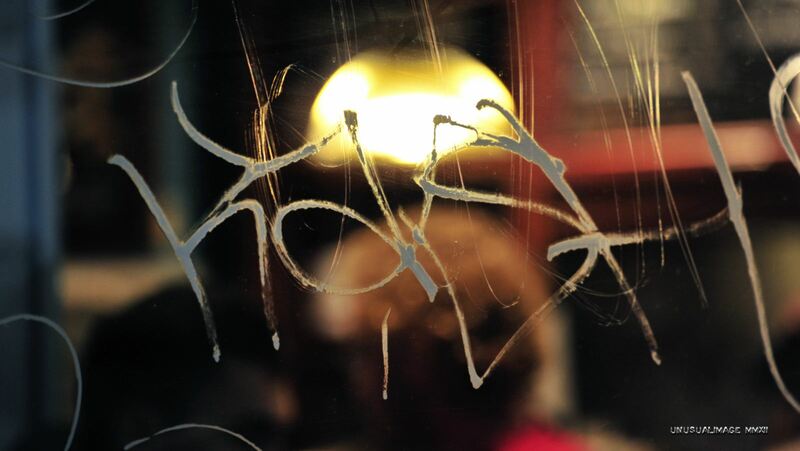 The materials used in these tags can be corrosive and damage glass permanently. Graffiti at pavement level is often of the tagging variety with notable exceptions. Banksy’s iconic old rat can still be seen, only just, at pavement level on New Oxford Street. When you are next in the vicinity of Tottenham Court Road Station see if you can spot it – you may be surprised to see many live rats running around, having had their habitats disturbed by the excavations being carried out as part of the preparatory works for Cross Rail. With the quantity of fast food shops in the area there are rich pickings for huge populations of well-fed rats. Graffiti art at high locations pose interesting challenges of access for artist such as Mighty Mo, Gold Peg and other members of the Burning Candy crew and High Roller Society. These images are more endurable partly because they are difficult to be reached by other artists and buffed by the Council’s Graffiti removal teams. Graffiti everywhere: paint, tags, and stickers. Graffiti embodies a multifaceted pattern of information and our challenge is to make sense and create order from what appears on the surface to be chaos and disorder. 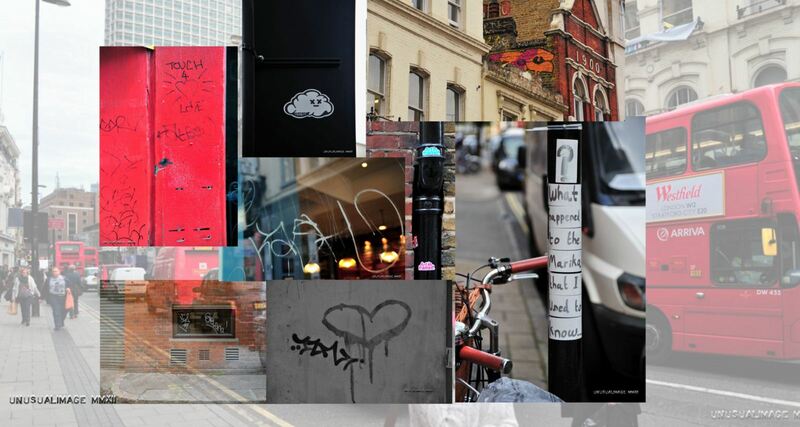 Graffiti provides the raw data and we need to interpret and order that data in intelligent and creative ways. 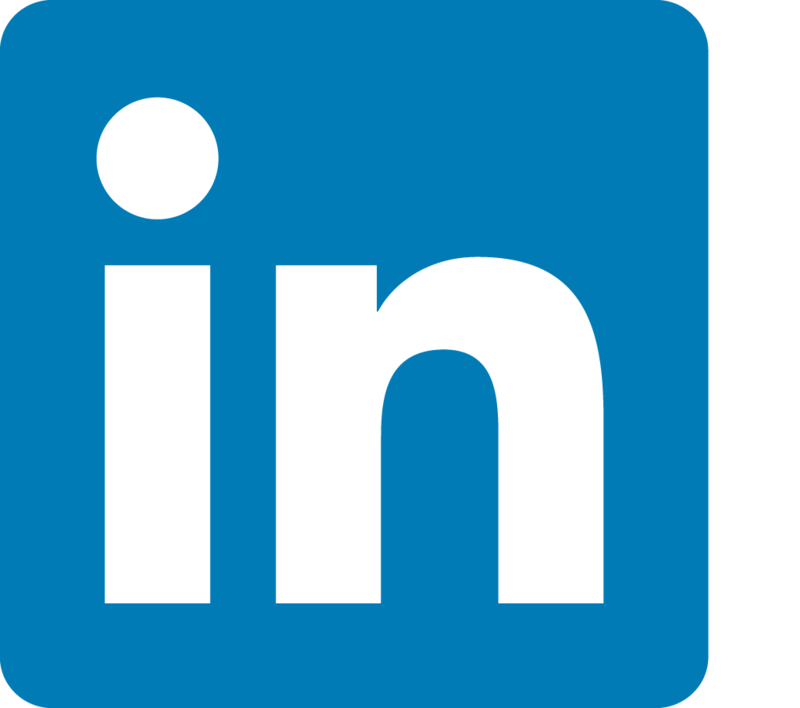 This touches on fundamental questions in relation to information and communication – How to measure and manage its quantity and quality? How to use this information to create order? What needs to be deleted because of its negative energy and what provides impetus for life affirming action? And if we are thinking about the most efficient means of getting our messages across; who knows? At best these imaginations provide a morass of raw data that can be converted into patterns of probability and portent.